To evaluate the impact of local therapies on survival and disease progression in patients presented with stage IV breast cancer who are treated with appropriate systemic therapy if local therapy done early on in the course of management. A retrospective cohort study of 61 females with de novo stage IV and received systemic therapy ± local therapies. Thirty nine patients had local therapy (LT) (63.9%) vs. 22 patients (36.1%) had no-local therapy (no-LT). Median overall survival for total population was (40 months). Median OS in LT-group was 43 months Std. Error 3.86 (95% CI: 35.43–50.57), vs. no- LT group was 26.0 months Std. Error 8.17 (95% CI: 9.980-42.02), (log-rank test=2.492; 1 df; P=0.114). Median time to first progression (TTFP) for total population was (21 months, Std. Error 4.45 (95% CI 12.27- 29.73). Median TTFP in LT-group was 26 months Std. Error 8 (95% CI: 10.4–41.5), and no- LT group was 13 months Std. Error 4 (95% CI: 5-20.9), (log-rank tes =2.85; 1 df; P=0.091). Loco-regional therapy in de novo metastatic breast cancer has no impact on survival or time to first progression. Systemic therapy in this patient population remains the standard of care. Breast cancer is the most common malignancy among females. It accounts for 12.5% of all cancers. Saudi Arabian National Cancer Registry showed 26% of all cancer among females is breast cancers, and 12.8% are presented as stage-IV compared to 6% incidence in Surveillance Epidemiology and End Results database (SEER) [1,2]. The standard of care for patients with metastatic breast cancer is systemic treatment with palliative intent while local therapy has been reserved for palliation for cases with primary tumor complications, such as skin ulceration, infection and bleeding. Due to the advancement in breast cancer systemic treatment in the last decade a longer survival is observed even in stage IV patients that led to a greater interest for prophylactic local therapy to prevent devastating local progression. A number of retrospective and SEER data analysis suggests that local therapy in form of surgery or radiation of the primary breast tumor in patients with stage-IV disease at initial presentation might have a positive impact on survival [3-11]. Despite the trend in overall survival benefit in this group of patients treated with this approach, often patients selected were younger and presented with oligo- bony or soft tissue metastases . They also had less co-morbidities compared to the non-surgical group presumably because surgeons were reluctant to expose patients with poor prognostic features to the risks of surgery. In one of the retrospective study, the benefit is only seen among patients operated on before diagnosis of metastatic disease and it is suggested as a consequence of stage migration bias . Others found that surgery remains an independent factor associated with improvement on survival on a multivariate analysis . Other retrospective study on local therapy in de novo metastatic breast cancer patients suggested a greater benefit was seen in patients who were eligible to have targeted therapy in form of anti-estrogenic drugs and Herceptin . The biologic theories of the interactions between primary tumour and foci of metastasis are bidirectional. One theory suggests that local removal of disease might enhance the growth of metastasis because primary tumour was producing angiogenesis inhibitors and removal of primary tumor will induce angiogenesis [14-19]. On the other hand another theory on how local control may improve survival: hypothesis that controlling the disease locally reduces the overall tumor burden in addition to benefit of eliminating a potential source of metastatic spread and that loco-regional therapy eliminates the subset of cancer stem cells that are resistant to chemotherapy. Multiple retrospective reviews examined the role of breast surgery vs. no surgery but very limited data on the survival advantage in using breast radiotherapy as solo local treatment or in combination with surgery in metastatic breast cancer. A recent publication on loco-regional radiotherapy in patients with oligometastesis suggested that radiation alone has the same outcome on local control, progression free survival and overall survival as surgery plus radiotherapy . The benefit of local therapy in patients presenting with metastatic breast cancer is not well established. We hypothesized that all forms of local therapies have survival benefit in patients with de novo stage IV breast cancer who are treated with appropriate systemic therapy if local therapy done early on in the course of management if we adjust for other potential cofactors. Retrospective cohorts of women with metastatic breast cancer patients who present as de novo stage IV and received systemic therapy. This retrospective research was approved by research hospital committee. Patient data were collected from patients whom were treated in Princess Norah Oncology Centre at King Abdul-Aziz Medical City in Jeddah from 2002-2008. Two institutional databases were searched to identify patients’ population using two main keyword sets which are: (1) stage IV breast cancer (2) metastatic breast cancer. Patient age ≥ 18 year of age. Patient was fit to receive any form of systemic therapy either chemotherapy or hormonal therapy or other targeted therapy or combination. Uncommon histology for breast cancer (lymphoma, sarcoma, phylloidus tumor, small cell tumor). Of the 412 charts identified and reviewed only 61 patients (14.8%) were eligible to our study. Patient charts and medical records were reviewed for the 61 patients. Patients data were retrieved and collected on: local therapy, surgery, radiation, patient age at diagnosis, date of diagnosis, menopausal status, site of metastasis, extent of metastasis, histology, tumor and nodal stage, oestrogen, progesterone and Her-2 status, data on local therapy, systemic therapy, initial response to chemotherapy and second line chemotherapy . Data on survival, and progression were obtained from patients’ medical records and, in some cases through telephone calls. The primary objective of this study was to evaluate the impact of local therapy (LT) on patient overall survival in months (OS) in de novo stage IV breast cancer. Overall survival was defined as interval from diagnosis until death of any cause or last follow-up. Secondary objectives were to evaluate the impact of LT on time-to first progression (TTFP) which was defined as the interval between diagnoses until clinical or radiological confirmation of first disease progression. Sixty-one patients were eligible, they met inclusion criteria and included in the analysis. Median age at diagnosis is 48 year (mean=50.48). Total population characteristics are shown in Table 1. Postmenopausal women were (45.9%) and premenopausal were (54.1%). Oestrogen receptors positive disease were found in (63%) of our patients, progesterone receptors positive in (54.1%) and her-2 positive in (21.3%). Eighty-eight percent of our patients presented with multiple metastases and most presented with visceral metastasis (72.1%), while bony metastasis in (23%) and brain metastasis (4.9%). All patients received a variety of systemic therapy either of Chemotherapy only (24 patients) or targeted therapy (13 patients) or both (24 patients). Of the 61 patients 39 had LT (63.9%) vs. 22 patients (36.1%) had no-LT. of the 39 patients who had local therapy: 27 patients had surgery only, 3 patients had radiation only and 9 patients had both surgery and radiation. Eleven patients (18%) had lumpectomy, 25 patients (41%) underwent for mastectomy. Twelve patients had radiation (19.7%), only one patient had local radiotherapy (1.6%), while the other 11 patients (18%) had loco-regional radiation with dose range from (4240- 6600cGY). Patients’ characteristics for the two treatment groups are shown in Table 2. Characteristics were similar in the two groups, except there were more patients with higher nodal stage (N2, N3) in the local therapy group (0.019). Table 2. Shows patients characteristics for the two treatment groups. Overall survival in months for total population was (40 months, Std. Error 3.84 (95% CI 32.471-47.529). Median OS in LT-group was 43 months Std. Error 3.86 (95% CI: 35.43–50.57), vs. no- LT group was 26.0 months Std. Error 8.17 (95% CI: 9.980-42.020), (log-rank test=2.492; 1 df; P=0.114) (Figure 1). Figure 1. Kaplan-Meier Survival Curve for the two groups: group one had no local therapy (no-LT) and group two had local therapy (LT). Time to first progression for total population was (21 months, Std. Error 4.45 (95% CI 12.27- 29.73). TTFP in LT-group was 26 months Std. Error 8 (95% CI: 10.4–41.5), and no- LT group was 13 months Std. Error 4 (95% CI: 5-20.9), (log-rank test=2.85; 1 df; P=0.091). On univariate and subsequent multivariate analyses of predictive factors we found only progesterone receptor positivity remains an independent prognostic factor for improved overall survival (p<0.028). Progesterone receptor positive (P=0.039) and use of radiotherapy (p=0.001) remains independent prognostic factors for improved TTFP. Standard of care for patient presented with metastatic breast cancer is palliative systemic therapy. 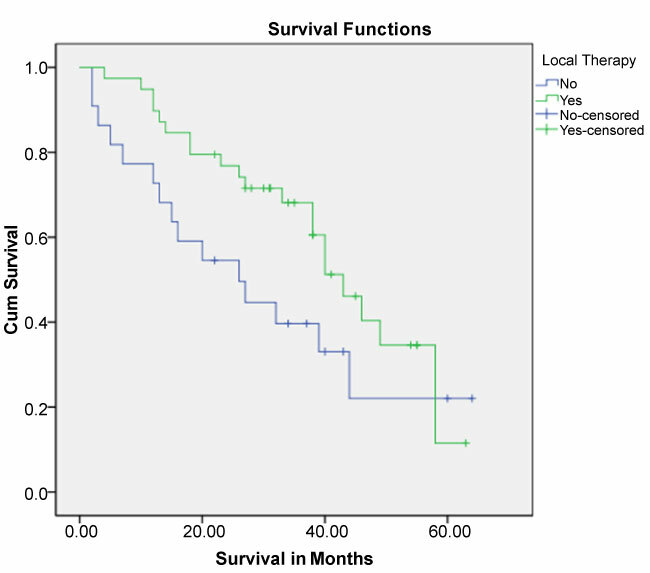 The optimal management in this group of patient is not well defined, as many retrospective data suggest that local therapy might improve survival . None of the publish results were prospective study, selection bias was considered a major issue as patients who offer this type of treatment were tend to be younger, fitter and have less disease burden. Indications of local therapy were: primary surgery while metastasis is discovered later at time of staging, palliation of local symptoms to avoid uncontrolled chest wall disease and in some cases as curative treatment for patients with controlled metastatic disease. Local therapy was either given in form of surgery alone, radiation alone or combination of both. Therapies were either given local or more comprehensive of loco-regional and some are more of palliative. Our study showed there is no difference in overall survival or progression free survival between patients who received local therapy in any form and patient who did not receive any local therapy if the patient received appropriate systemic therapy. All of our patients received systemic therapy which represent the modern era where appropriate hormonal and other targeted therapies are offered for most of those group of patient. In our study we found that the presence of progesterone receptor positivity is an independent factor associated with improved survival and time to first failure. This suggests that the presence of effective systemic targeted therapy associated with improved outcome. In multivariate analysis of our data we found that radiation associated with improved TTFP and we observed that all of our patients had radical dose of radiotherapy and all had loco-regional radiation except one had local therapy only. In addition some of published data showed an association of free surgical resection margin and improvement of survival , all these raised the issue of the quality of local therapies that offered in this sitting, and it give us more suggestion that the question of loco-regional therapy in patient with de novo metastasis breast cancer should be addressed in randomized controlled trial with elimination of all bias and provide full control on the quality of loco-regional therapy that offer to patients. As may be more comprehensive loco-regional therapy will be translated into improved local control and prolonged survival. Currently a few randomized controlled studies addressing this question are conducted by: TATA Memorial Hospital in India, Turkish Federation of Breast Cancer Societies and the Eastern Cooperative Oncology Group (ECOG Trial E2108). All addressing the issue of adding local therapy to appropriate chemotherapy in de novo metastatic breast cancer patients. Loco-regional therapy in de novo metastatic breast cancer has no impact on survival. Systemic therapy is the mainstay of treatment. Intent of treatment should be palliative to improve quality of life. Local surgery and/or radiotherapy prior or immediately following palliative chemotherapy should not be considered as standard practice, should not replace systemic therapy and left to an individual patient benefit assessment. ©2015 Nageeti T. This is an open-access article distributed under the terms of the Creative Commons Attribution License, which permits unrestricted use, distribution, and reproduction in any medium, provided the original author and source are credited. King Abdul-Aziz Medical City-Jeddah, King Saud Bin Abdul-Aziz University, Jeddah, PO. Box 7700, Makkah 24246, Saudi Arabia, Tel: 02-56650000; Fax: 02-5532235.